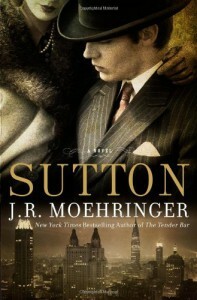 Moehringer has pieced together a fascinating portrait of the motivations and beginnings of one of the Unites States’ most successful and infamous bank robbers, and the undying love that determined the course of his life. Understanding just why Sutton was so attached to Bess Endner after she inspired a life of crime requires the completion of the novel to fully understand. Sutton also quickly and frequently cuts from past to the present for chats with Reporter and Photographer, and there are a veritable stream of characters constantly referred to only by their role or profession. Moehringer liberally uses this time construct throughout the novel, and it could have been used more sparingly. However, the other satisfying elements of the novel and the resolutions to some of the questions it raises made it worth minor narrative annoyances. The complex psychological portrait of Sutton along with other colorful characterizations, and an ear for dialogue makes this a worthy read for anyone interested in bank robbers, Old New York, and good old-fashioned star-crossed lovers.